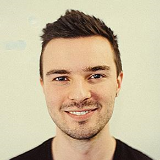 Christopher Gimmer is the co-founder of Snappa - the easiest graphic design tool you’ll ever use. We all know that when it comes to link building, we aim for the authority links in the first place. But they’re also the hardest to land. And when you have a million other things on your plate, link building can often get pushed to the side. Recently, I started experimenting with a passive link building technique. That is, the opportunities were coming to me instead of me going out and looking for them. It wasn’t complicated either. I just had to use a service called HARO (Help A Reporter Out). In this post, I’ll walk you through the exact process of how you can leverage HARO to get press mentions and build authority backlinks. 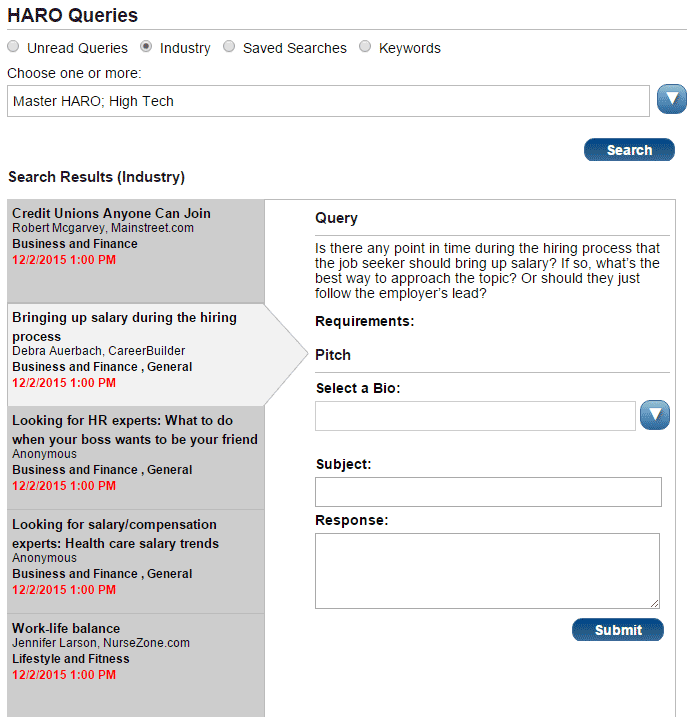 HARO is a free service that provides journalists with a robust database of sources for upcoming stories and daily opportunities for sources to secure valuable media coverage. 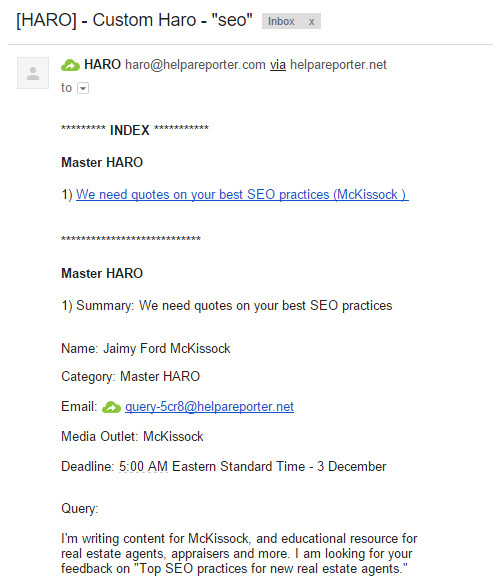 HARO (short for Help a Reporter Out) is one of best ways to get killer backlinks from authority news sites. What’s great about HARO is that journalists come to you. This differs from most link building tactics where you are required to do all of the outreach. What’s even better is that big media outlets are using the service. We’re talking Mashable, Time, Wall Street Journal and New York Times just to name a few. The opportunity to get press and land high authority backlinks is ripe for the taking. First, you’re going to sign up as a source. After you sign up, you’ll get three emails a day — at 5:35 a.m., 12:35 p.m. and 5:35 p.m. ET from Monday to Friday. The emails will be broken down into different categories. Each request will have a title and an outlet in brackets. 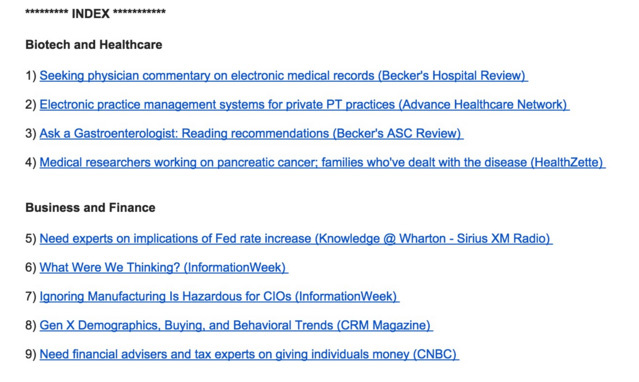 You’ll want to browse through the email and find relevant topics that you can contribute to. In my case, I saw the following request for Inc. I knew that Inc.com was a big publication. 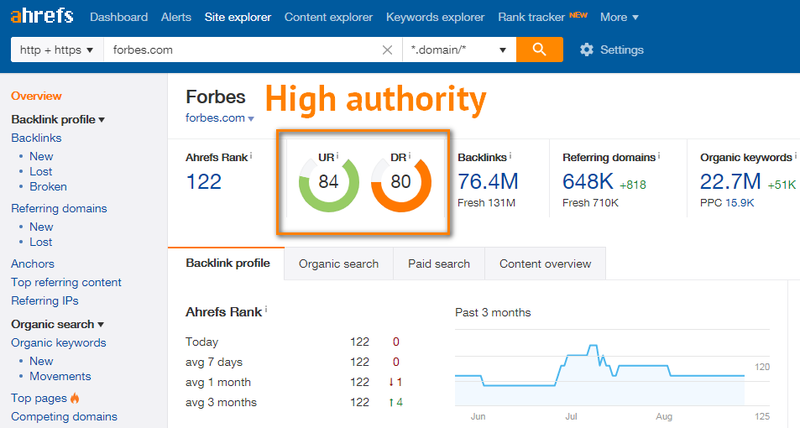 But using the Ahrefs site explorer, you can evaluate the domain authority for any inquiry you’re thinking of responding to. Any website with an Alexa ranking under 1 million can use HARO, so not all of the outlets will be really high authority. The bigger the outlet, the more responses they’re going to receive. Therefore, you need to be on top of your game. When responding to an inquiry, make sure to send a very thoughtful response. A one or two line email is not going to cut it. Give them something that they can literally cut and paste into their article and make the journalist’s job as easy as possible. As you can see, the reporter is asking a few questions in the query. It would be a mistake to answer just one of them or provide very little detail. In my reply, I made sure to address each and every question in detail. 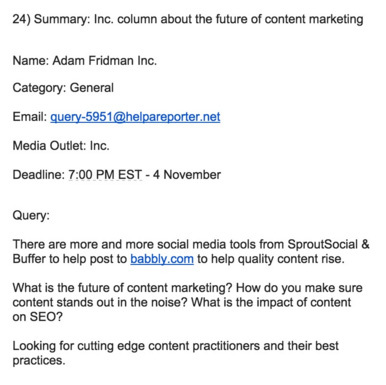 When replying to a query, you should also include your author bio and the link to your website. Write it out exactly how you want it to appear in the article. 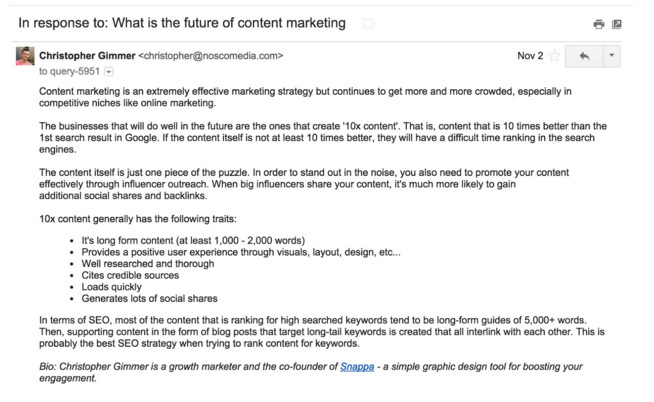 This reply took me just a few minutes to write, and because I went in‐depth, I was contacted just two days later asking for my top tip regarding content marketing best practices. The reporter’s assistant then informed me that they would be using me as a source and they’d let me know when the article went live. Sure enough, a few weeks later, the article was published and we landed a link and some exposure for Snappa — an easy to use graphic design tool we built for marketers and business owners. After seeing the early success of this strategy, I’ve now created a “HARO” label in my inbox and filtered all of these emails to go into that folder. All it takes is a minute or two each day to check all the inquiries and reply to anything that sounds promising. Just be aware that some inquiries have tight deadlines and require a quick reply. Make sure you send valuable, quality pitches, not spam. Don’t make mistakes outlined in our experience‐based article about blogger outreach. Links from the media are among the strongest and most authoritative backlinks you can build to your site. However, cold pitching to journalists can be tricky, and response rate will generally be low. This leads to the common misconception that journalists don’t welcome input from third parties. After all, journalists are incredibly busy people with tight deadlines, and if you can make their life easier, they will be glad of the help. That’s why HARO is such a great service. Instead of sending press releases and pitches that will probably not be of interest (unless you are very lucky) the journalists themselves are directly soliciting contributions. As Christopher mentions, the easier you can make things for the journalist, the more likely they are to include your input. It really should be a case where they can copy and paste your pitch straight into their article. Once you’ve given the service a spin, it’s definitely worth considering upgrading to a paid HARO account. There are many additional features that become available, which can give you a competitive edge when pitching. Here’s a quick rundown on HARO Premium. There are 4 subscription levels available (including the free option). For most purposes the Standard account at $19 a month will be more than sufficient. The first advantage of a paid subscription is that you can set up a profile/bio that will be automatically inserted into your pitches. The bio includes links to web properties and social media. These all help to build credibility and authority when pitching to journalists. 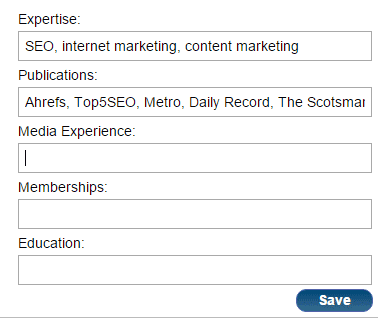 You can also add details on your specific areas of expertise and any publications you have previously been featured in. As with the free account, you can subscribe to opportunities in specific verticals, however with a paid subscription you can also set up alerts for media requests that match specified keywords. You can even get SMS alerts if you are in the US. 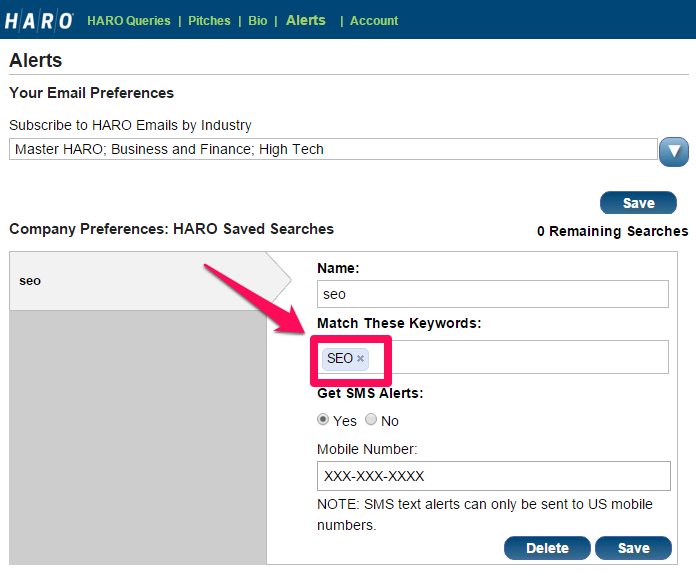 In the example below I have subscribed to the ‘Master Haro’, ‘Business and Finance’ and ‘High Tech’ emails and have also set up an alert for the keyword ‘SEO’. From now on I’ll get an email alert like this whenever new media requests include the keyword ‘SEO’. 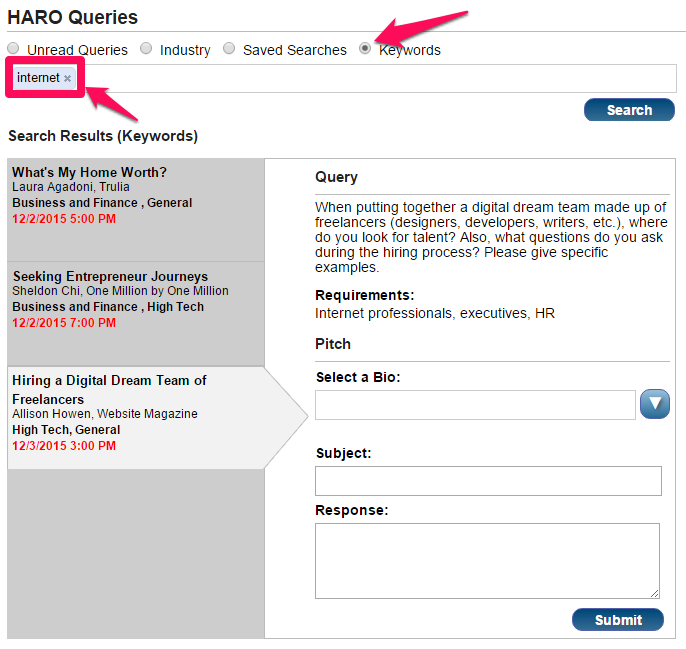 Another nice feature is the ability to browse and respond to queries directly through the online interface. You can even search queries by keyword. So as you can see, the paid HARO accounts offer a nice bunch of extra features to help you secure media mentions. Unlike most link building strategies, HARO is a very passive way of generating high‐quality backlinks and press mentions. Just keep in mind that it requires a bit of patience and you’ll need to provide high‐quality responses to the inquiries. Nevertheless, for the level of effort required compared to the potential gain, it’s definitely worth your time. 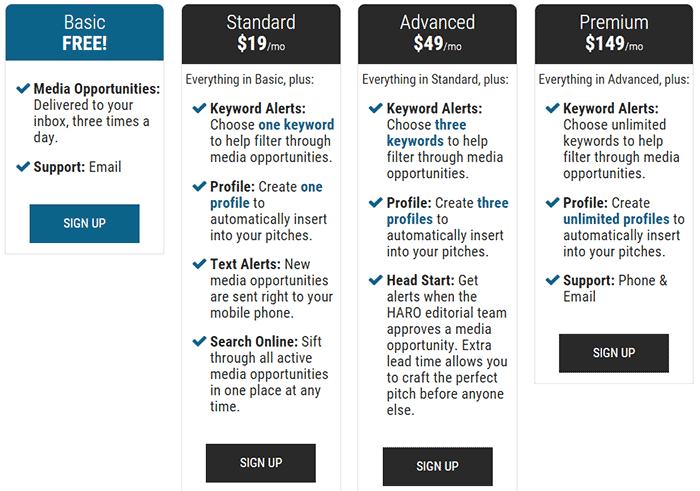 You can get published on a news website or a magazine like Entrepreneur.com, which makes HARO a great place to pick up high‐quality backlinks. 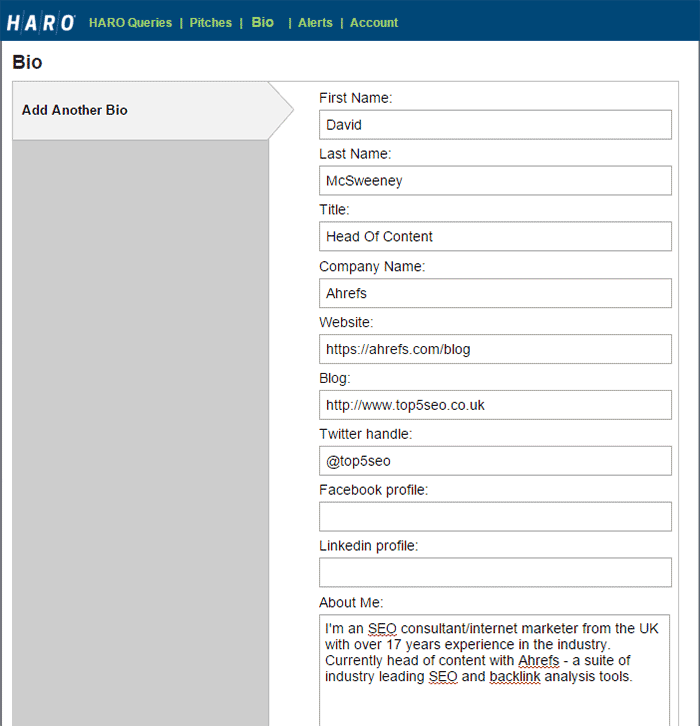 Have you had success using HARO to secure media mentions? Or any questions about the service? Please leave a comment below and let us know! 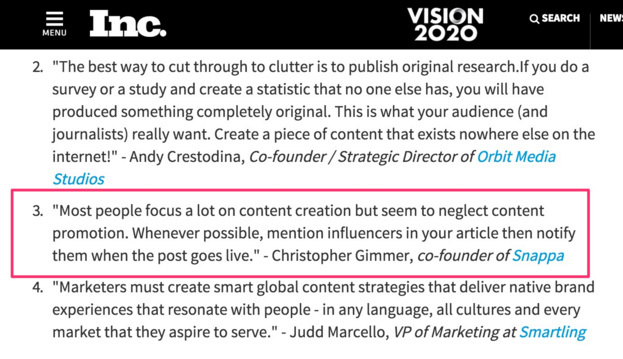 For another actionable method of gaining high authority links from the press, check out our viral content case study.